Thanks for this great step by step process - I would like to use it for any new staff or children to our school in future. We have just begun our Blogging journey this year and this will certainly be useful to get the new users started in future! Thanks for sharing it with us. As far as I know, you don't need a Gmail account to make a blog in blogger.com, use your existence email account such as Hotmail or Yahoo account, with 'em you can access all Google account, try it. I think you're right about the different email address but I thought if I encourage people to make a Google account they all the other fabulous things that Google gives like Google Docs and Google Reader which can really add to the experience. Thank you so much for this Blog. I am new to using a blog and am finding your info really helpful. I teach in Putaruru in the South Waikato. 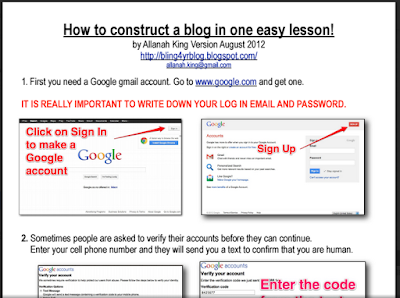 Thank you Allanah for the post and the supporting materials in your blog posts! I am a professor at Mount Saint Mary College, Newburgh, NY. 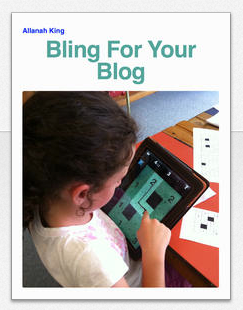 I have been using blogging in every teacher training course I teach. I strongly believe in the power of blogging for developing reflective practitioner's skills of the future teachers. If you still have classrooms to connect with I would love to get in touch and engage my teacher candidates in global interaction. The iBook is fab-thanks Allanah. I'll be helping teachers @Ponsonby Primary to start using Blogger in their classrooms and your blog will be our go to guide! Tau kē!